The Head of the Charles is often called Rowing Christmas. That is generally referring to the gathering-of-the-family spirit of the regatta. But it could just as well apply to the Attager Row shopping experience. The banks of the Boston side of the river, parallel to Soldiers Field Road, are lined with vendors from Friday morning through to the last race of the day Sunday. As you round the corner under the Eliot Bridge and step foot onto Attager Row, the first scent that greets you – well, it’s difficult to discern the scent. It’s not one in particular, but the mixing of the $14 chicken finger and French fry combo meal and the $4 hot chocolate and coffee. Included too is the New England clam chowder in a bread bowl, where spectators with Red Sox hats and British accents are enjoying what the region has to offer. There are free samples of the new fruit smoothie flavored Clif bars, and deeper in the Clif bar tent are free coffee and samples of granola and the nut butter line of Clif bars, which were given away at last year’s regatta. Companies give away stickers and keychains and lanyards, and others simply offer a place to charge your phone. Nutrition start-up Momentous was one of the vendors engaging in giving away free samples. Founded in Jackson Hole, Wyoming in 2016, its NSF-certified nutrition supplements are already in the locker rooms of the Boston Celtics, the New York Yankees, and the University of Alabama football team. At the regatta, they offered samples of their chocolate and fruit punch flavors, in their RedShift and AbsoluteZero formulas. RedShift is used for endurance recovery, while AbsoluteZero is better served for everyday use. Both were for sale at the regatta, at a 30-percent discount compared to the prices on their website. Next to Momentous, Yolande Rubini is helping patrons try on handmade rings and necklaces while processing one customer’s transaction on her cell phone. Her husband Jaime founded Rubini Jewelers in Alexandria, Virginia in 1985, and has been staffing a booth at the regatta since the event was so small, registration took place at a mall. The jewelry at the Rubini family tent ranges from $10 and upwards, with customers checking in with Yolande for prices on items that cost hundreds of dollars. The event is special to Jaime, who is a rower himself and coaches at T.C. Williams High School in Alexandria. The Head of the Charles is one of their “better income regattas,” according to Yolande. They will travel next week to the Head of the Schuylkill and end their season at the Head of the Hooch. Official regatta merchandise is for sale in tents scattered throughout Attager Row – t-shirts, blankets, sweatshirts and teddy bears. 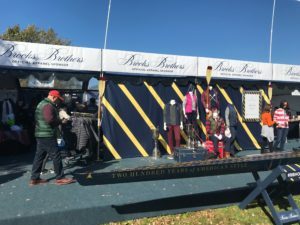 Brooks Brothers sells HOCR-branded items as well, ranging from a $20 table tennis set to a $199 jacket, though the employee at the door to the Brooks Brothers tent won’t share how much revenue the company expects to pull in across the regatta weekend. Rowing gear is there in abundance. Spend $20 on some workout clothes, or $300 on a stroke coach. Buy some new oars—$600 for a pair of sculls, or $3000 for a set of eight sweeps. Or spurge on that new shell–singles start under $10,000, or trick-out a new eight for around $50,000. And, if you’ve managed to make your way through all of the vendors and have some spending money left over, perhaps your Christmas wishes will come true at one of the very last booths along Attager Row. 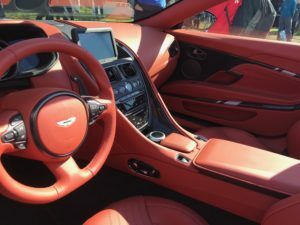 Aston Martin, the official automobile of the Head of the Charles Regatta, is on site for the second year in a row, with couches and televisions and spectacular river views – and a one-of-a-kind vehicle that could be yours for just $290,000. The Aston Martin on display is part of their new convertible line and was specifically created for the regatta. Every Aston-Martin vehicle is hand-assembled in England, and the vehicle on-site has original hand-stitching and light blue detailing. It can reach speeds up to 190 mph. By Saturday afternoon, no one had expressed serious interest in buying the vehicle, but Andy Frank, an Aston Martin learning and experience professional, there to answer questions about the vehicle and the company, was certain that it would go by the end of the weekend.